My latest addiction is Craftsy courses as I continue on with my goal to 1% infinity. I recently finished The Perfect Cupcake course with Jennifer Shea. She said she loves taking her favourite desserts and making them into a cupcake. 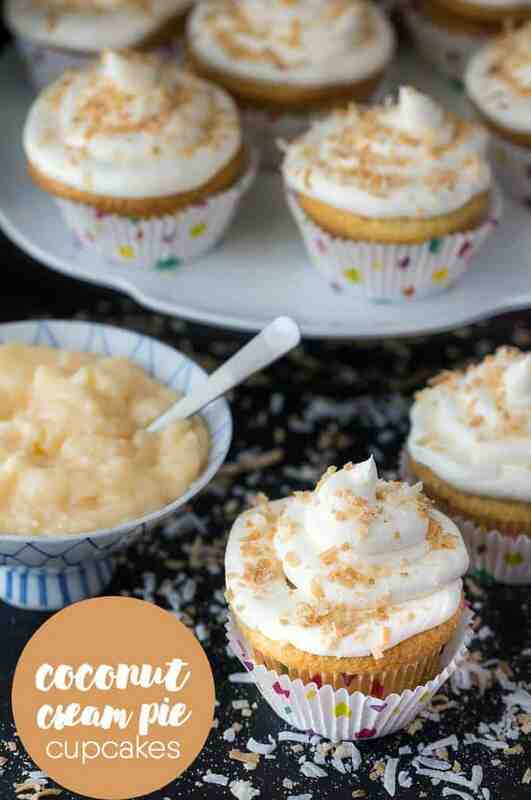 I was inspired to create this recipe for Coconut Cream Pie Cupcakes. I used a few shortcuts to keep the process as easy as possible. They turned out fabulous! I used Pillsbury refrigerated pie crust and cut them into small circles. Use the rim of a glass to create them as close as you can to the size of your muffin tin. Your going to parbake them first and then they’ll finish baking when you put them into the cupcakes. That’s my first shortcut. If you make your own pie crust, go ahead and use that. The cupcake portion is coconut flavoured thanks to my handy bottle of Coconut Extract. 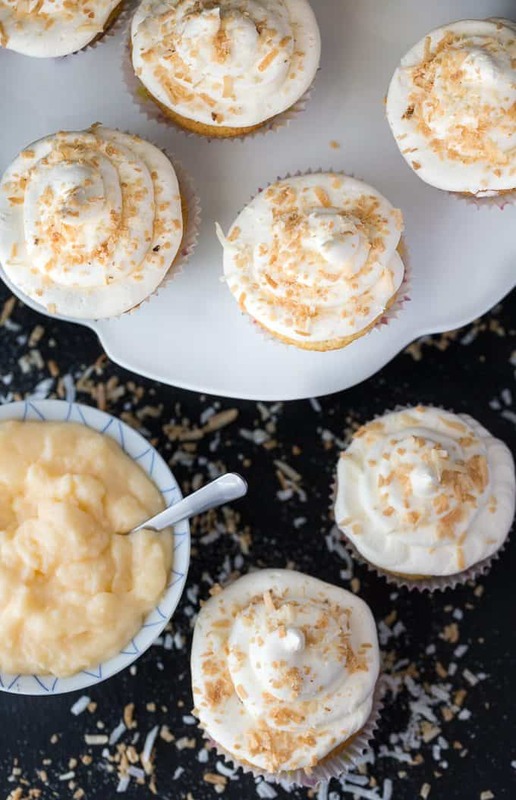 After the cupcakes have cooled, you are ready to begin the fun part: filling them with delicious coconut pudding! I use an apple corer to remove the centre of the cupcake. You have to be careful to not push it too far down or you’ll hit the pie crust at the bottom. Save the “plug” because you’re going to break a chunk off to cover your hole. For the filling, I use a coconut cream pie pudding mix. Feel free to make your own homemade version. This was my second shortcut. The final step is piping on that sweet Coconut Buttercream Frosting and finishing with a sprinkle of toasted coconut flakes. I have a Wilton Decorating tip set so I have my pick of designs. If you make a lot of cupcakes, it’s worth picking up and it’s not that expensive. I was very happy with how my cupcakes turned out. This recipe makes 24 cupcakes and they did not last long. I gave some to my cousin to share with her family and she said they were gone within a few hours of her bringing them home! I’ll be sharing more dessert inspired cupcake recipes coming up. I’ve recently made one for Pumpkin Pie Cupcakes that I can’t wait to share with you! Have you ever made your favourite dessert into a cupcake? 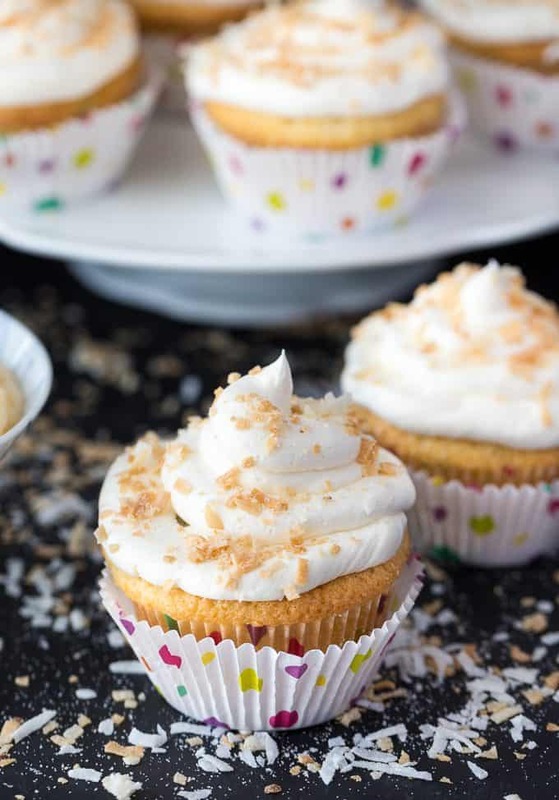 Think Coconut Cream Pie but in a cupcake form. 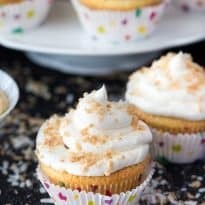 They have a pie crust, sweet coconut cupcake filled with a coconut cream pie pudding and topped with a beautiful coconut buttercream frosting. Preheat oven to 400F. Using a small glass with an opening about the same size of the bottom of a cupcake, cut the dough into rounds. You’ll need 24. Place milk and sugar in two small bowls. Brush both sides of pie crust rounds with milk and place on a greased baking sheet. Sprinkle each round with sugar. Bake for about 5 to 6 minutes. They will not be completely cooked at this point. Watch them carefully because they burn easily. Place on a cooling rack. Preheat oven to 350F. In a large bowl, combine flour, baking powder and salt in one bowl. Combine milk, half and half, vanilla extract and coconut extract in another bowl. Add butter and sugar to a mixing bowl and beat on low speed until smooth. Add eggs, one at a time, mixing in between. Add about 1/4 of the flour bowl ingredients to the butter, sugar and egg mixture and mix on low. Add about 1/4 of the milk bowl ingredients to the butter, sugar and egg mixture on low. Alternate like this until all the ingredients are added and the batter is smooth. Place one pie crust round at the bottom of each of the cupcake liners. Fill cupcake liners almost to the top. Bake for 25 to 30 minutes. Cool in the pan for 5 minutes and then transfer to a cooling rack. Prepare according to package directions and let cool. Cream butter with a mixer on low. Slowly increase the speed to medium. Add sugar, one cup at a time, on low speed. Add vanilla extract, coconut extract and salt. Beat on low till combined. Turn speed up to medium high and beat for about 5 minutes, until it’s whipped, smooth and creamy. Using an apple corer or a paring knife, cut out a circle for the filling in the centre of each cupcake. Be careful to not go down too far or you’ll cut into the pie crust bottom. Save the cupcake piece you removed for step 3. 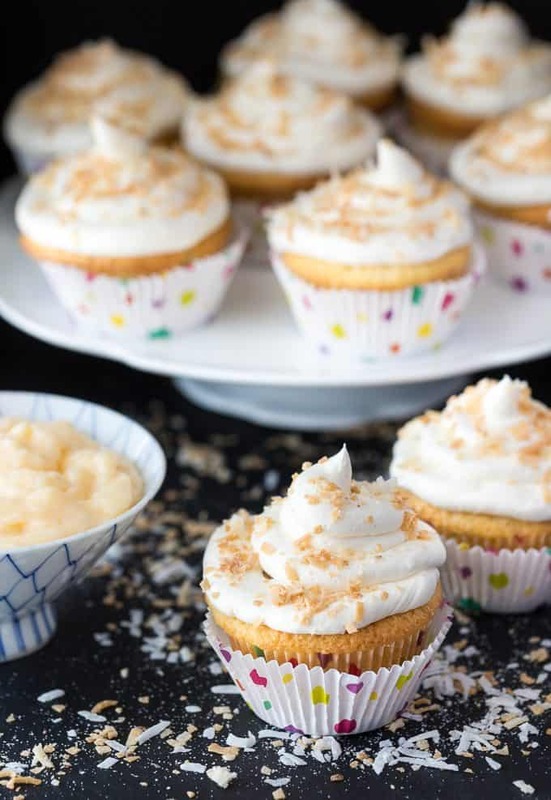 Fill cupcakes with coconut cream pudding. Place the small cupcake piece you removed to close the top of the cupcake. Using an icing bag and tip, frost the cupcakes. Sprinkle with toasted coconut if desired.